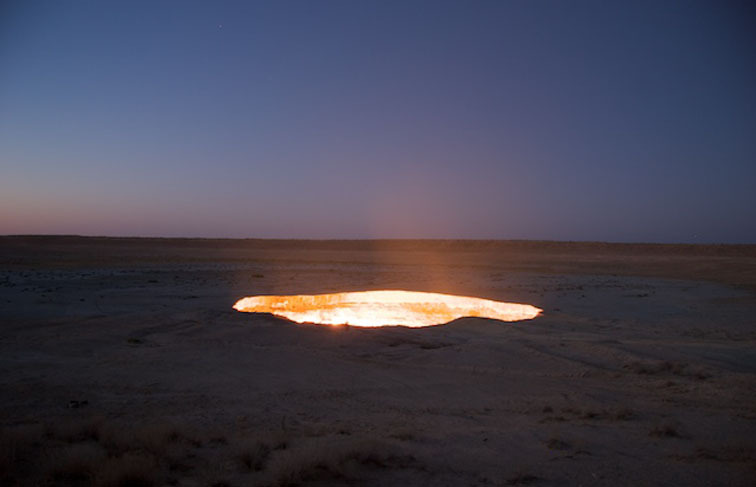 Turkmenistan is seventy percent desert – the Karakum Desert, to be exact. The nation is divided into five provinces, the second largest being the Ahal Welayat which occupies the south-central portion of the country. Ahal is almost entirely desert and contains just fourteen percent of the country’s population, but it is also rich in natural resource deposits. When Soviet scientists discovered a cache of oil reserves near the town of Derweze in the Karakum Desert, drilling quickly commenced. When a drilling rig collapsed and created a crater, large amounts of methane were released. When the oilmen attempted to burn off the methane, it started a fire that still burns over forty years later.